Hi, my name is Vendulka Battais – together with my partner Olivier we run a patchwork, quilting and felting shop – it’s called OliVen and this blog is about the journey this big step in our life took us on. We started our shop on the Isle of Wight in UK in 2011 and both of our children were born on the Island too. In 2015 we moved to Suffolk, to lovely village of Monks Eleigh where we started with new enthusiasm and continue to grow. Even though I’m busy as ever, I love every minute of it. I make a lot of patchwork quilts and teach patchwork in our shop and travel to teach groups, but my passion is more on the arty side – I love to make textile hangings which carry some sort of spiritual message in a form of quotes or symbols. I hope you will enjoy my blog; as English is not my first language I’d like to apologize for any grammatical errors. 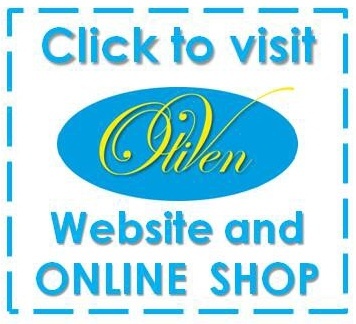 I truly enjoy reading your Journey with Oliven. I’m glad I went to your website and was able to read more about you and your shop and location. I had envisioned you living on a tropical island, especially when you mentioned your mom coming from Czech Republic to the island. Well Isle of Wight and Britain are islands but definitely not tropical! I looked at some of your work and it’s quite lovely. Do you have a poet about your cathedral window method? It sounds like you are doing it differently than the usual way. PS I’m not French, just the first name is. My husband is Slovenian, originally Lusin with a “sh” sound to the “s”. yes, the Isle of Wight is far from the tropics, but it was very nice living there for 4 years. I’m glad you enjoy reading about the journey our shop is taking us on. We’re very grateful to do what we do. I am doing the Cathedral window technique slightly differently, that is true. I have a couple of patterns for sale on Craftsy and am working on a book … end of this year if everything goes well.